- Accumulate at least $48,000 (This is $40,000 in 2010 money) or $4,000 a month for investments during 2015, beginning 2016. – Complete. This has been done, $4,000 a month like a clock work. #1 I am sitting on a pile of cash, not investing them, i.e. not translating them into dividends (~ $100 K). #2 USD is stronger, so the companies with operations outside US struggling to deliver performance. Average dividends 3% after taxes. ↑ Received 4 additional Company shares for re-invested dividends ($0.47 USD per share before taxes or 5% annual dividends). ↑ EUR appreciated to USD by 4% or $6,725 USD for my portfolio. Pew Research Center recently published a very interesting report on what is happening to the middle class in the US. The report itself freely available online is recommended for reading, however if you do not have time to go through all 74 pages of it, I will share my observations and reaction to it. 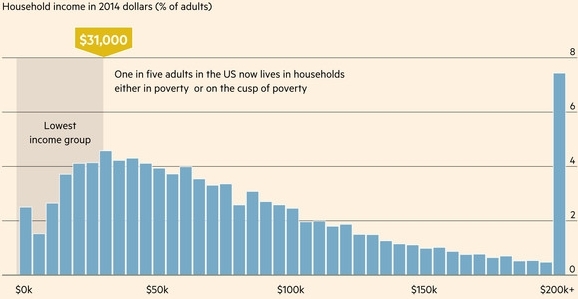 In 2015, 20% of American adults were in the lowest-income tier, up from 16% in 1971. For the three person household the middle-income range was about $42,000 to $126,000 in 2014 dollars. Lower income households have incomes less than two thirds of the median and upper income households have incomes that are more than double the median. Under this definition, the middle class made up 50% of the U.S. adult population in 2015, down from 61% in 1971. In early 2015 120.8 million adults were in middle-income households, compared with 121.3 million in lower and upper-income households combined. Number of adults living in the middle income households has been steadily declining from 1971 to 2015. As one commentator put it: American dream used to be a to own a house and two cars, new American dream it is to have a job. We have started our family budget, tracking all expenses back in 2007. Initially it was looked at as fairly cumbersome and time consuming exercise. However, over the period of a few years we educated and trained ourselves to spend 5 minutes a day in the evening to record all expenses. Now with the statistic we could more accurately predict and plan our expenses. It also helps to clarify some fallacies and incorrect assumptions. For example, as a young parent when you look at nursery cost you think that over the period of time, as your child grows it will be cheaper. Our personal experience clearly tells that it is not happening, nurseries keep rising fees and even at “low inflation” you are lucky if you keep paying the same prize. However, enough of that, let’s go directly to figures and who we spent $92,814 vs. previous 6 years. ↑ Vanguard Emerging markets is up by $1,545 USD. ↑ Vanguard Emerging markets quarterly dividends $194 USD or 6% at the current price. ↑ Vanguard S&P 500 quarterly dividends $196 USD or 1.9% at the current price. ↑ Gazprom annual dividends 4,542 USD (USD 0.225 per share). ↑ Precisious metals are up by 733 USD as investors are seeking safe harbor. I recently finished reading “The Undercover economist strikes back” by an English writer Tim Harford. Tim has an education in economics from Oxford University. Although not very well known outside England is quite popular in it, mainly as a columnist for Financial Times newspaper. Aim of the book was to bring macroeconomics a little bit closer to a non-economist in an entertaining fashion. The book is written like a dialogue between the writer and reader, based on real life examples. The way topics are presented it has a lot of similarities with “Irrational Exuberance” by Robert J. Shiller. Modern economy for general public is increasingly focusing on psychology, how people react and behave. As example acceptance of the wages falling in real terms, while growing in nominal ones – “money illusion”. Tom continues on about Bank of England commenting: “ Public trust in the pound is now maintained by the operation of monetary policy”, apparently with a totally straight face. This basically means that most of modern currencies worth something as long as people believe in it. The worrying fact is being a influential economist in his own country the author is advocating having inflation at about 4%, this would help to maintain nominal growth of salaries about zero. - Due care in the treatment of customers. So they excluded Vanguard S&P 500 and Emerging markets sold in US on the USA exchanges. I think they are doing it to reduce US tax entanglements with these. Many EU brokerage funds removed products listed on the stock exchanges in Israel, South Africa, New Zealand and Russia. mcf - hundreds cubic feet (North America, Henry Hub). Inflation assumed at 2% a year. ↑ Received $48 for Vanguard Emerging markets ETF and $179 for S&P500, which is roughly 1.5% each after taxes. - Accumulate at least $48,000 (This is $40,000 in 2010 money) or $4,000 a month for investments during 2015, beginning 2016. - Portfolio should be able to generate $9,000 a year after taxes in the money of the day (In 2014 it was $7,500). Stretched target – $10,000. - Think about additional source of income. My blog start bringing some measurable income but want to beef up with some streams. - To cover 6 themes on financial independence. - Publish easy tracker for the long term portfolio performance. I have no intentions to move towards an entertaining blog with 2-3 weekly posts. I will endeavor my best efforts to stay on personal subject of financial independence and family budget. - Create list of books to read & read them- 12 books is minimum. - Publish the books reviews. Be happy. Run 1,000 miles during the year.